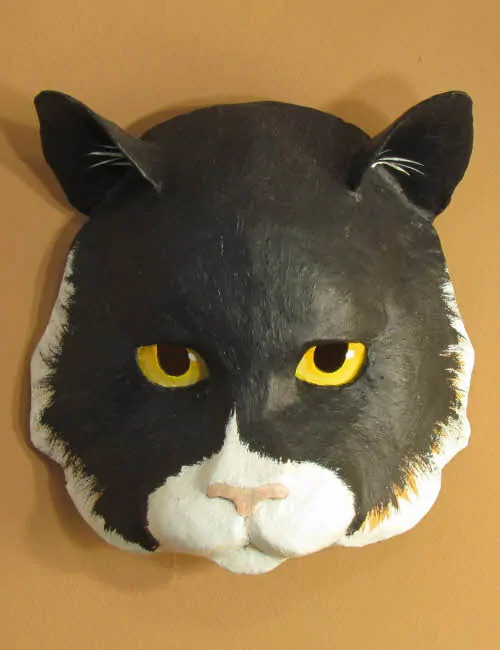 This pattern can be used to create a wearable paper mache cat mask, or make a wall display mask so you can enjoy it all year long. 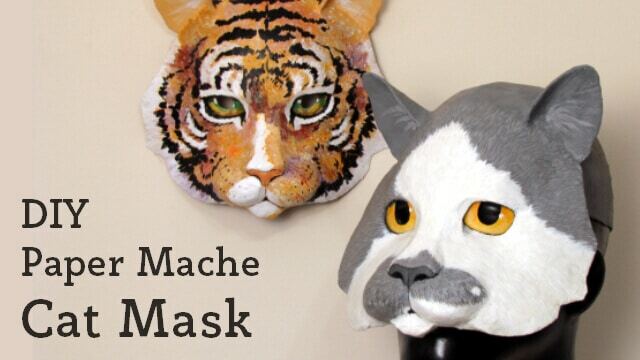 Paint it to match your own favorite cat. 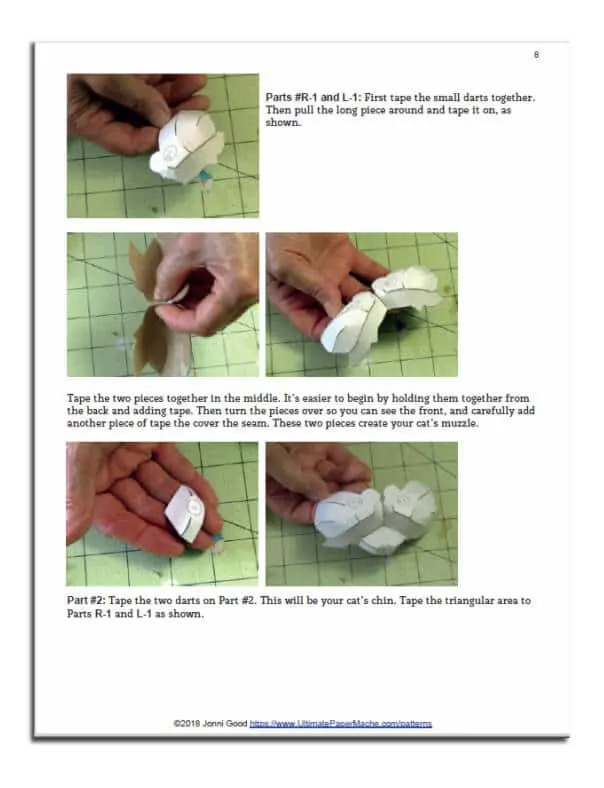 Print the downloadable pattern on copy paper or full-sheet labels. Attach the pieces to the cardboard from two cereal boxes. Cover the mask with either paper strips and paste or a very thin layer of Jonni’s paper mache clay recipe. Then add some acrylic paint to turn it into a truly one-of-a-kind work of art, by using your favorite kitty as a model. 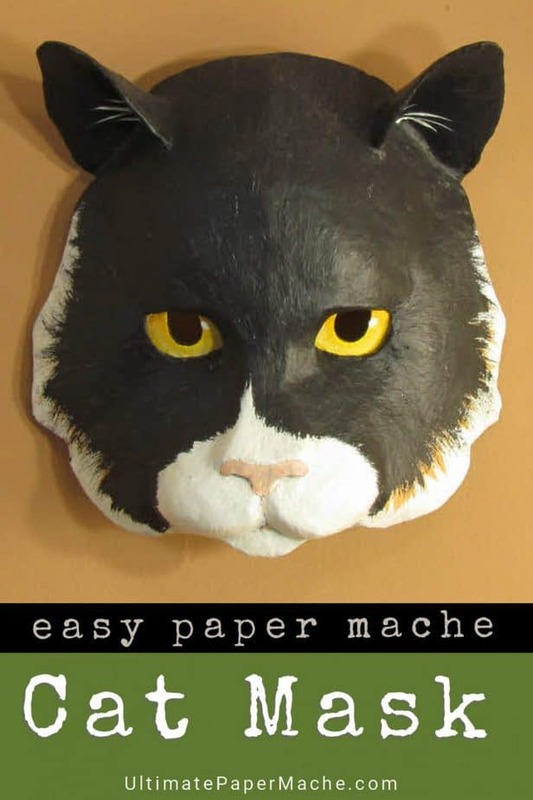 You can find paper mache recipes in the Art Library on this site. When you use one layer of paper mache on both the inside and outside of this mask, it will be surprisingly strong, but still very light. Finished size: About 9.5 inches (24 cm) high, 9 inches (23 cm) wide and 9.5 inches (24 cm) deep if built as a helmet-style mask, or 3” deep (8 cm) if built as a wall display mask. 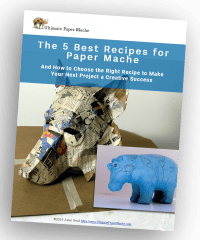 How Fast Does Paper Mache Dry? Hi Lyn. You could use glass eyes, although I haven’t ever done that. You would need to order them from a taxidermy supply house. 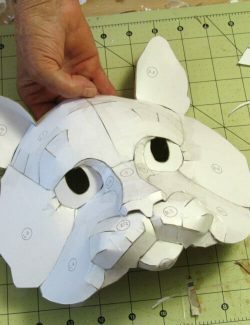 Several people have used Styrofoam balls or ping-pong balls for the wolf and lion masks. They use hot glue to attach the balls behind the eye hole, cover the balls with paper mache, and paint them. 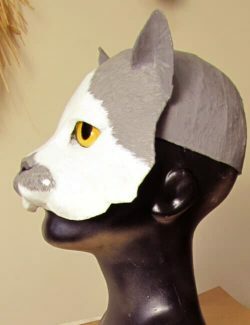 The cat mask has a pattern piece for the eye with the pupil cut out so the wearer can see out. If you didn’t cut out that part of the piece you can paint the eye without adding any balls or glass eyes. I made a video several years ago about how to paint a dog’s eye on paper mache, and you might find it useful. Also, any YouTube video that shows how to paint an animal’s eye would work just as well on a sculpture. If you try it, please post a photo so we can see how it comes out! Gracias Jonni, confeccionaré la máscara de lobo y la compartiré con mis alumnos. Hi Ana. After you make the wolf, I hope you’ll show us, too. We would love to see it. Very nice masks Jonni. I know what you mean about using color. When I get a chance to use colors besides the neutral wildlife colors, I get so excited. I want to do something(can’t decide what) where I can pour paint on it and just leave it to do its thing. I did that for my granddaughters. I got them a bunch of art supplies, etc for a gift and I made them a “fancy ‘ box to keep it in. I bought a gift box and painted it white so I would have a blank canvas. Then I diluted some complementary colors and then just poured! It was fun to see how the colors intereracted with each other and learn which ones are more opaque, etc. I had to do it 6 times to cover each side but it was great fun. 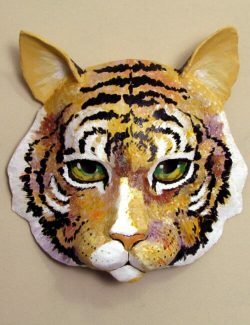 One could do this on a cat mask or any paper mache sculpture. Do you have any suggestions? This mask will be very popular around Halloween, people just love doing up that holiday. Hi Eileen – what an interesting idea! It reminds me of the abstract paintings my daughter has been playing with, but I think her colors are mixed with a resin of some kind. Some of them work, and some don’t, but that’s part of the excitement. I don’t know if I’ll ever be brave enough to do something like that, but if anyone makes a cat (or anything else) with Eileen’s idea, I sure hope you’ll show us how it turns out. The beauty of acrylics is that you could paint over it if it did not turn out. You might lose a minute amount of detail but not much. I just need to think of something that would work well with that sort of finishing. I did think of Jessie’s work when I commented above. One would certainly need a working knowledge of color theory to pull this off. OMG…you are sooo inspiring! Thanks for sharing, hopefully someday I’ll get through with all my lined up projects that I can get back to Paper Mache! Thanks, Sandra. Good luck with your to-do list. I hope you have some very exciting projects on the list. Those are great masks. I especially love the “tiger” cat. These remind me of when I gave origami a try. One of the many things I admire about you is the continual creativity and exploring new methods of art. Thanks. I can’t wait until I get the house back together to continue the creating adventures. There is much creativity on this blog, and I admire it very much. Very cute! Nice paper pattern.